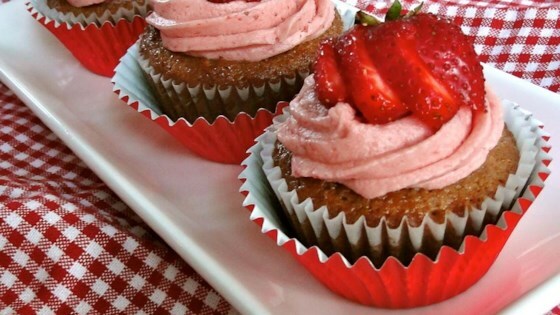 "I've been messing around trying to make a perfect strawberry cupcake to go with the Real Strawberry Frosting I developed a couple of years ago. It's been a long road and lots of cupcakes tested and tasted along the way. The trick was NOT using puree as I do when making the frosting. Rather, grinding freeze-dried strawberries into a powder brought this cupcake recipe out of my test kitchen and into my recipe box! I am so pleased with the results!" See how to make light, lemony cupcakes from scratch. To make strawberry powder: grind 1 to 1.6 oz (depending on your taste) freeze-dried strawberries into a fine powder using a coffee grinder, Magic Bullet® or food processor. You can find freeze-dried strawberries at Trader Joe's® or online, or make your own dried strawberries. Loved it! I just used frozen strawberries instead and added a little bit more, I chopped them and added them to batter as they were still frozen. Yum!